But now that we’re back in work mode, pecan pie with whipped cream for breakfast isn’t ideal. Does this sound like you? Then it’s time to give our bodies a dose of nutritious love and tame those sugar cravings so our 2017 pants still fit. If you’re looking to get your (health) groove back, Macy’s has some great deals on kitchen gadgets to help whip, blend, and stir you back into shape. Want to amp up your daily intake of vitamins and minerals? 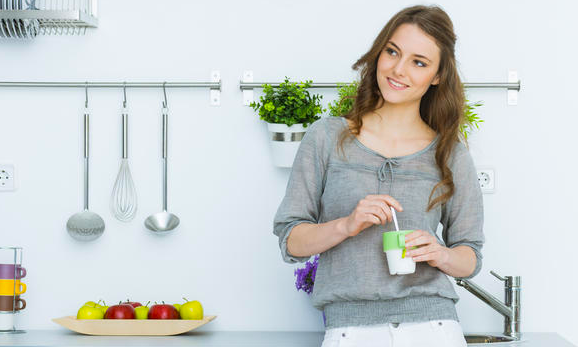 Add a juicer to your kitchen and enjoy fruits and veggies on a whole other level. Sip this food group on-the-go and sneak some greens into your child’s favorite drink. A quality juicer will last a long time, so get the one you want. Try this Breville Fountain Juicer – it has two speeds, great reviews, and is affordable. Remember, back in the day, when we brought our lunch to school? Now’s a fine time to go retro. Making your lunch keeps you in control of what you’re eating and will also save you a ton of money on restaurant bills each month. This lunch bag from Pack It is freezable, light weight, and has built in gel walls to keep things as cool as you are. Stay honest with that scoop of peanut butter and know just how many calories you’re adding to a meal. By measuring things out, you’ll not only bake a cake that will rise, there’ll be no mystery around how much you’re consuming. 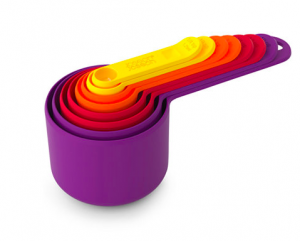 Try this fun 8-piece measuring cup and spoon set by Joseph Joseph. They’re dishwasher safe and add a nice pop of color to any kitchen. For that lean protein in your meal plan, let a George Foreman grill do the heavy lifting by draining the fat as your meat cooks. The double grill (above and below) cooks food evenly on both sides so you can worry about the vegetables while this baby sizzles in the background. Bummed that fruits and vegetables are a food group? 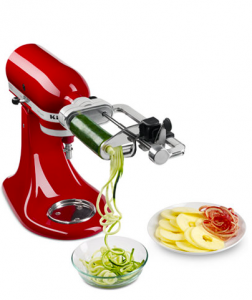 Try a spiralizer to change the look, shape, and texture of your food. This simple device brings creativity to any meal. Toss in some thinly shaped zucchini to your pasta for high mass and low calories. You’ll have fun with the different shapes and textures, while scoring your daily dose of antioxidants at the same time. For a range of options, try Macy’s featured spiralizers. A vegetable steamer will make you fall in love with vegetables again. It’s inexpensive, easy to use, and makes a huge difference on the texture of your food. Also a great tool for seafood lovers, this steamer by Martha Stewart is stainless steel, dishwasher safe, and adjusts to the size of your pot. A nice cutting board has the power to inspire the chef in all of us. You’ll want a quality board that’s durable (to protect those kitchen counters) and easy to clean (because you have better things to do with your time!). 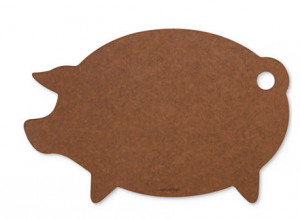 Try this multi-colored 3-pack option by Joseph Joseph, this wooden cutting board by Martha Stewart, or bring your personality to the kitchen with a pig or heart-shaped board. Anything you can find to make healthy eating fun and simple is well worth the hunt. Create a kitchen full of inspiration, so instead of dreading this room, you’re excited to play with your new toys any meal of the day!